Crankcase breather and bracket kit allows the installation of aftermarket air cleaner assemblies on late model bikes equipped with OEM CV carburetor or Delphi EFI systems. 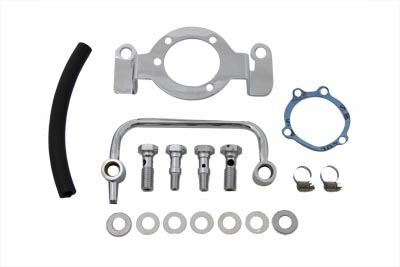 This kit is used on models with cylinder head/crankcase breather systems and includes bracket, filter, hose, and all mounting hardware necessary for installation. Order air cleaner separately.